First of all: this is a great recipe, totally worth it and I love Ina Garten. Often when I make Ina’s recipes I know I’m going to be shelling out some dollar bills. Lobster Mac and Cheese, Truffled Pasta, Saffron Risotto… you get the idea. When I post recipes like that I don’t think I need a disclaimer but I wanted to give you a heads up on this bark. 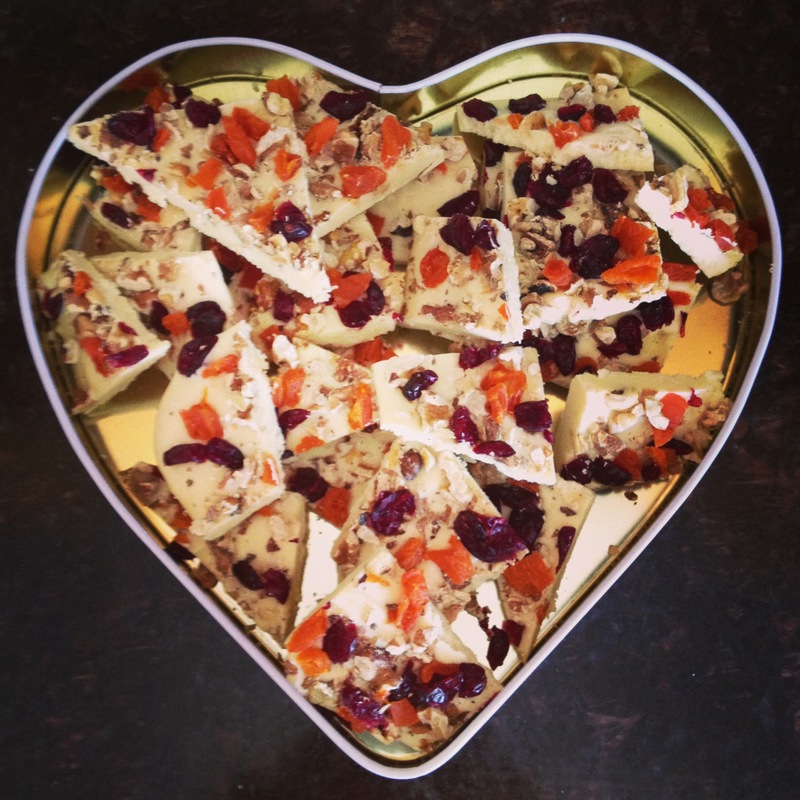 Ina calls for “16 ounces of very good white chocolate”. I’m sure in Ina world 16 ounces of white chocolate was her carry on during her flight back from Europe but for me it was 4 Ghirardelli bars- the best the grocery store by my parents could offer. So these are four bucks each and you need four so you’re already over $15 before buying the toppings. I want you to picture an 8 by 10 inch square because that is how much bark this recipe makes. So you’re looking at around $2 a chew for this bark. Okay, at least I gave you a heads up unlike Ina. Like I said- it is really really good bark. Prep your toppings first: 0.25 cups dried cranberries, 0.25 cups diced dried apricots, 0.5 cups toasted walnuts, chopped (toast for 8 minutes at 350 degrees F). 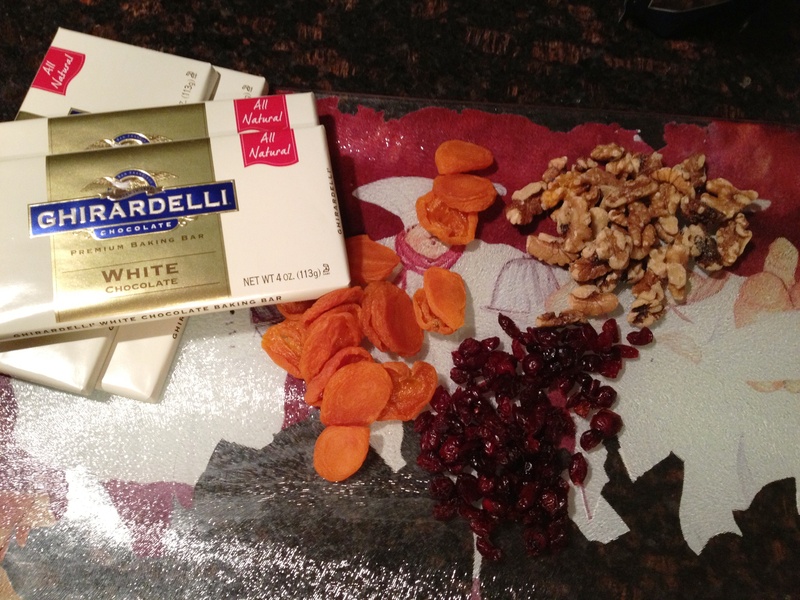 Finely chop three of your white chocolate bars and place in a glass bowl. Chop the fourth bar and set aside. Here, again, is where Ina gets so Ina on herself. 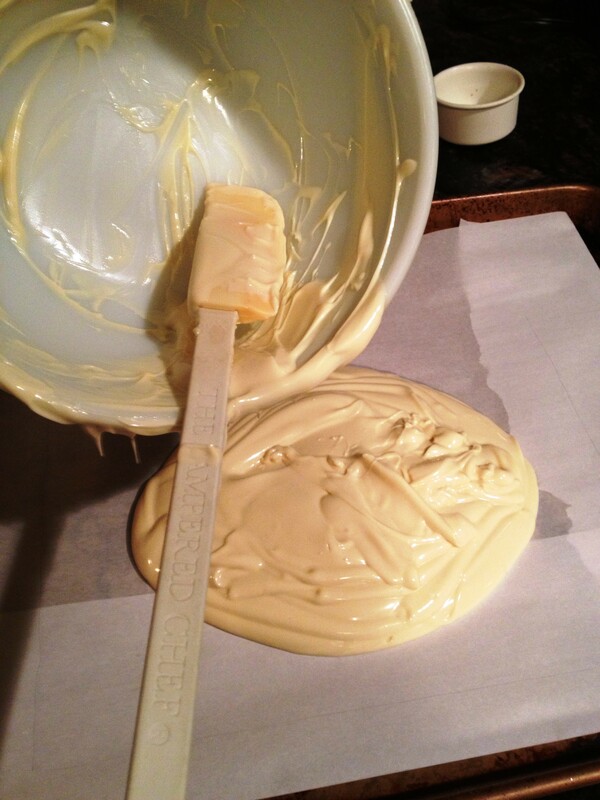 You need to microwave the white chocolate you put in the glass bowl for 30 seconds. Ina’s instructions and I quote, “Don’t trust your microwave timer – time it with your watch”. What? WHAT? The operative word here is “your”. According to Ina- you, me and anyone that is not her or Jeffrey is a mere peasant. Does she think I am using the world’s first microwave? Does she think I’m using a 40 year old microwave but spending $40 to make her white chocolate bark? Well I went ahead and timed my microwave and believe it or not it does come with the ability to count back from 30. Moving on. You will be microwaving the chocolate a total of 3 times for 30 seconds. After the first two times stir with a rubber spatula. 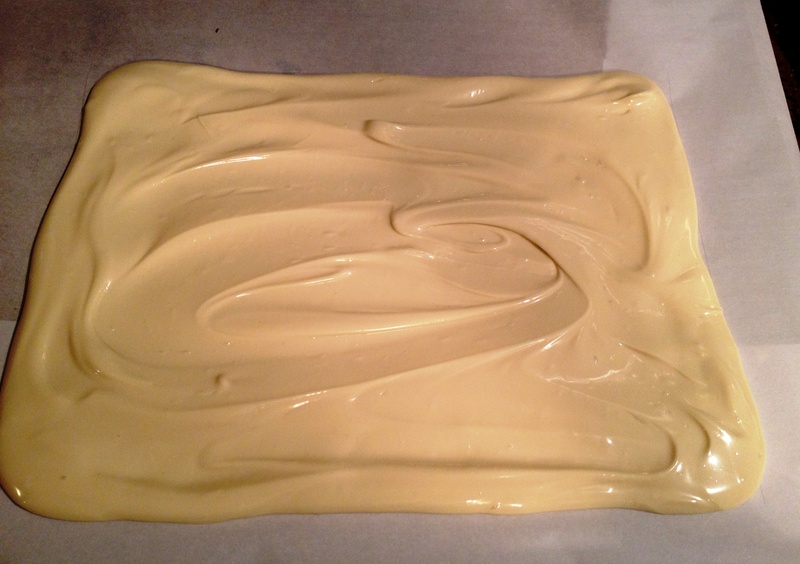 After the final 30 seconds add in the reserved bar of chopped white chocolate and stir until smooth. Poor onto parchment paper. Smooth out into an 8 inch by 10 inch rectangle. I drew mine on there in advance but you can eyeball it. 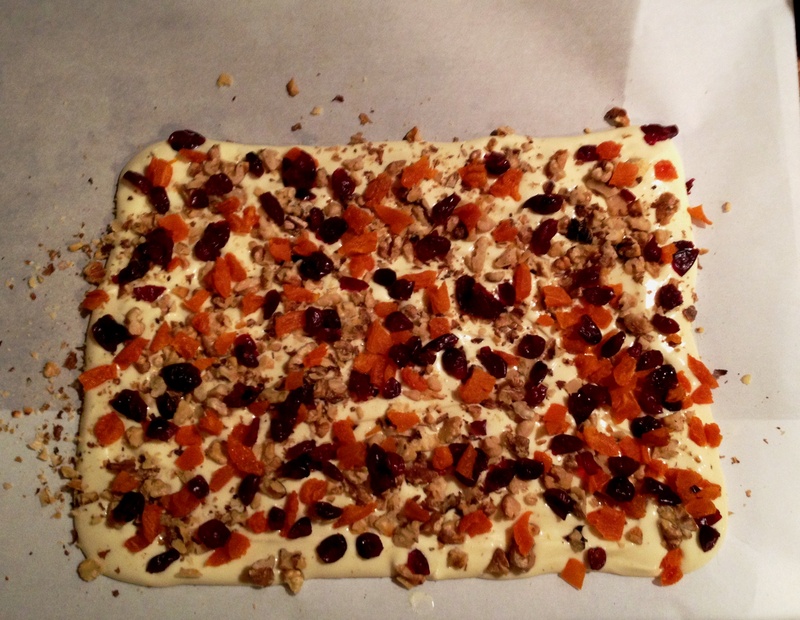 Cover with the dried fruit and walnuts. Let sit at room temp for 2 hours or chill in the refrigerator for 20 minutes. Cut into irregular shapes. I’m sure Ina kept these in a silver Tiffany’s box she bought just to hold her white chocolate bark but a heart shaped tin you found in your parents basement works too. White Trash Option: According to Ina I’m sure that would be using your own microwave since it clearly cannot tell time.